British Columbia history nerds rejoice! We’ve got a new Road Trip Time Machine video for you. 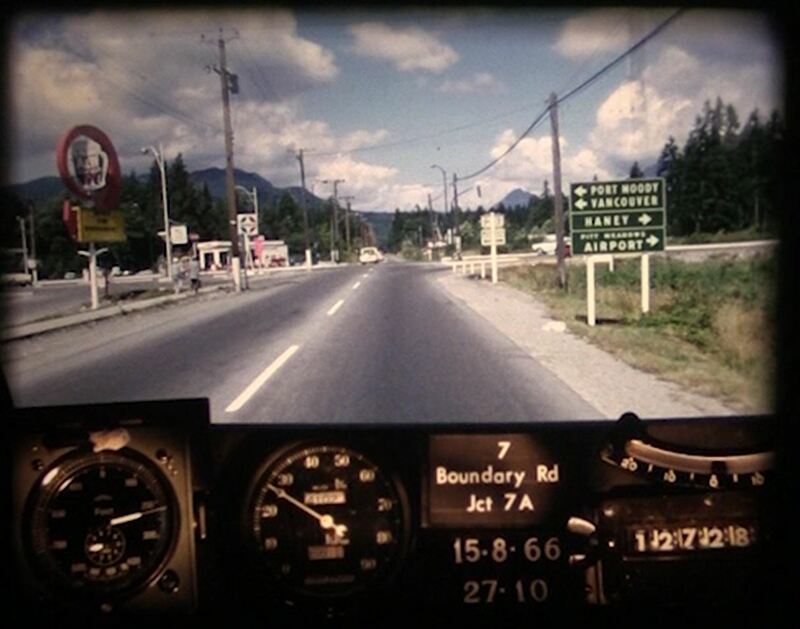 In this episode, our flux capacitor (aka photolog) will take us back to 1966 for a cruise along BC Highway 7 between Burnaby and Maple Ridge. This route begins in the City of Vancouver as Broadway, changing its name to Highway 7 after crossing over Boundary Road in Burnaby. From there, it travels east through Coquitlam, Port Coquitlam, Pitt Meadows, Maple Ridge, Mission and Agassiz to a junction with Highway 1 north of Hope. To say that things have changed along this route is an understatement. In fact, so much has changed, we considered highlighting the things that haven’t changed – just to keep it short. But then we realized we’d be beating you to one of your favourite things about these videos – spotting those iconic roadside spots along the way! As the ministry responsible for numbered highways across the province, we maintain jurisdictional control over key transportation corridors running through major urban centres; however, as cities grow and change, it often makes good sense to pass control of some routes back to the municipality it runs through. That way, they can maintain control of their important thoroughfare and we can do the job we know best – provincial highways. While there are certain sections of Highway 7 still under our control (approximately 118 km to be exact), the responsibility for the operation and maintenance of the rest of the route now lies with others (such as TransLink, the City of Burnaby, the City of Coquitlam, etc.). These videos are digital versions of 16 mm ‘photo-logs’ collected by rigging a camera onto a car and taking still images every 80 feet or so. Those stills were then run together as a single film to create a visual record of road condition information from across the province. This allowed our engineers to study a stretch of road without having to travel there. Pretty cool stuff. Today, we use a specialized van called an automatic road analyzer, with computers, lasers, GPS and high definition cameras to collect information about our highways and roads. When we digitized this film, we slowed it down to approximately 25 per cent of its original speed. That’s because our engineers had specialized machines to play these videos back at high speed, so they could view long stretches of highway quickly. Some of you have asked us to slow these videos down even more to see all the awesome things. We totally get that, but we have found that the quality and playback of the videos suffers too much below 25 per cent. But don’t fret! 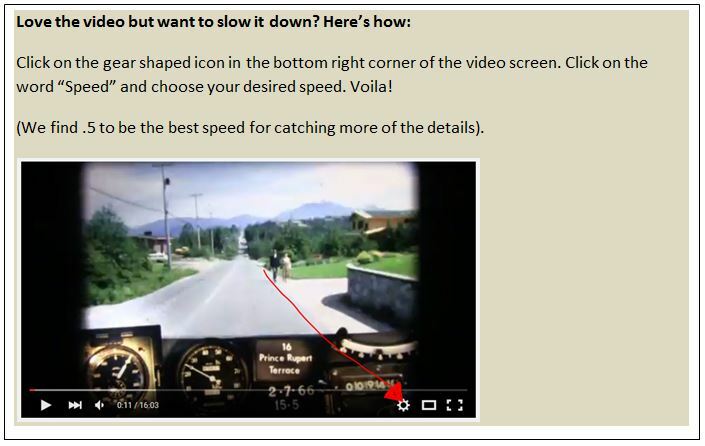 You can change the play back speed on YouTube by clicking on the gear icon in the lower right hand of the video screen, selecting speed and choosing a slower speed. That was simply awesome. You must by now have hundreds of replies like mine saying “I remember driving that road and on…and on…. Thanks for sharing this. Diggin’ the old A&W sign!